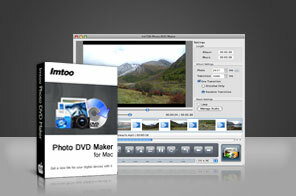 ImTOO Photo DVD Maker for Mac is designed for ones who want to preserve their collections of photo into DVDs and view photo slideshow in a DVD player. It allows you to convert all your photos into a DVD disc and burn a fine-quality DVD. ImTOO Photo DVD Maker for Mac is easy to operate and it can bring great convenience to enjoy your photos anywhere in case you have any type of DVD player. ImTOO Photo DVD Maker for Mac is not simply transferring photos into DVD and burn a copy of DVD; it is an photo album maker which can create special digital photo albums with fantastic effects. You can apply dramatic effects on your photo albums, rotate and flip photos or insert audio files as background music. Convert a batch of photos to DVD discs with super speed and burn photo to DVD slideshow. Create ISO files and DVD folders with photos except DVD discs. High performance is enhanced for batch conversions and superior high conversion and burning speed are available. Hundreds of fade-in and fade-out transitional effects can be applied and you can set the display time of a single photo as well as the transitional time between two photos. Autorotation is available which enables the imported photos rotating to the proper direction. You can rotate the photos to any direction freely like to left, to right, to flip or to mirror. Autorotation is also provided. Add background music by inserting an audio file to bring more fun in photo view. You can adjust various output parameters, such as writing speed, volume label, video quality, audio channel, quality and etc. to burn distinct photo DVDs. NTSC and PAL standards are available on photo DVD burning to suit different requirements. Interface is offered with multiple languages, English, French, Spanish, German, Japanese, Simplified and Traditional Chinese. Convert AVI, MPEG, WMV, DivX, MP4, MOV, etc. videos to JPG, PNG, GIF, BMP format pictures on Mac OS. Convert DVD to JPG, PNG, GIF, BMP pictures, even HTML page on Mac OS.